Super-Flow® V extended surface area & low pressure drop minipleat filters are designed for use in most commercial and industrial HVAC systems where medium to high efficiency filtration is required. Super-Flow®V filters are available in average efficiency ranges: 65%, 85%, 95% and 98% per ASHRAE Standard 52.1 test methods and 95% DOP. They may be operated at face velocities from 0 to 750 fpm. 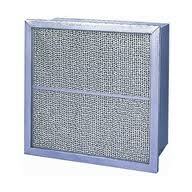 Super-Flow®V filters are UL 900 Class 2 listed. Super-Flow® Q mini-pleat filters are designed for use in most commercial and industrial HVAC systems where medium to high efficiency filtration is required but with minimal cost. Super-Flow® Q filters are available in average efficiency ranges: 65% and 95%. The filter may be operated at face velocities from 0 to 500 fpm. 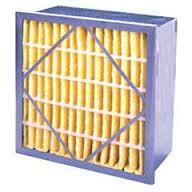 Super-Flow® Q filters are UL 900 Class 2 listed. PrecisionCell II extended surface mini pleat rigid filters are a nominal four inches deep. They are designed for use in most commercial and industrial HVAC systems where medium to high efficiency filtration is required. They are available in average efficiency ranges of 60-65% (MERV 11), 80-85% (MERV 13), and 90-95% (MERV 14) per ASHRAE Standard 52.1 atmospheric dust spot test methods and ASHRAE 52.2. PrecisionCell II extended surface minipleat filters now offer the end user high efficiency filtration performance in minimal media pack depths of 4 inches deep in 60-65% (MERV 11), 80-85% (MERV 13), and 90-95% (MERV 14-15), and are available in a corrosion resistant metal frame (M) for box style or optional metal frame with a single 13/16" header (MSH). 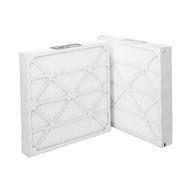 Rigid-Air extended media surface rigid filters are designed for use in most commercial or industrial HVAC systems where medium to high efficiency filtration is required. They feature your selection of media backed with expanded metal and pleated. The pleats are held in place by rigid pleat separators, available in either plastic or metal styles on 12"depth filters. 6" depth filters feature rugged fiberboard separators. Flanders introduces the newest member of the PrecisionCell design family. This filter that has been tested and certified to be MERV 16 or higher for applications requiring higher efficiency than our standard ASHRAE filters and lower pressure drops than traditional DOP filters. PrecisionCell extended media separator type rigid filters are designed for use in most commercial or industrial HVAC systems where medium to high efficiency filtration is required. PrecisionCell filters are available in average efficiency ranges of 60-65%, 80-85% and 90-95% per ASHRAE Standard 52.1 test methods and offered as a MERV 11 to 14 according to ASHRAE Standard 52.2. The PrecisionCell GT features extra heavy-duty construction to meet the rigorous demands of gas turbine rotary machinery air filtration applications. They may also be utilized where extreme velocity or turbulence have rendered other products to be ineffective. PrecisionCell GT filters are available in ASHRAE efficiencies of 60-65% and 90-95% in either single or double header versions. PrecisionCell HT filters are designed for high temperature applications up to 900 degrees farenheight. They feature the same rugged construction as the Gas Turbine PrecisionCell. The HT version is manufactured of specially selected components to meet high temperature requirements.